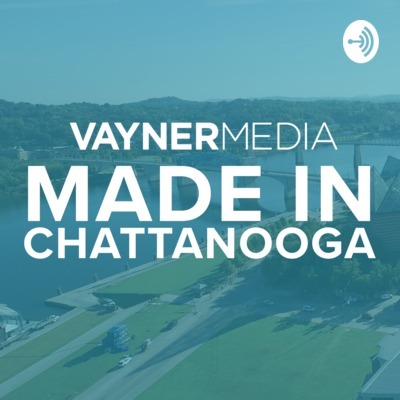 A podcast brought to you by VaynerMedia from the Chattanooga Public Library, Made in Chattanooga tells stories around business, marketing, creativity and innovation occurring in the Southeast. Episodes will explore business and marketing trends, current events and developments in Chattanooga, Tennessee. 21 episodes! It's been a wild ride and to close out the year and our first season of Made in Chattanooga, Mickey chats with Charlie Brock, the outgoing CEO of Launch Tennessee, a resource for entrepreneurs to gain traction as they launch their business. And a blast from the past, Nick Lutsko returns to talk with Jesse about his upcoming album, Swords, coming out in Spring 2019. Calling all creators! We're on the road again! This time we're live at TopCon, an annual design conference in Chattanooga. Join Chris and Jess as we talk with Kelli Anderson, Scott Fuller, Orlando Arocena, and Bethany Mollenkof about their creative process and how they overcome creative blocks. Join Mo as we talk about how to be more mindful with your finances with Peak Financial and the release of their new app, Peak. Next, we sit down with Carlos and Lauren and Floami Fly, a local hip-hop/rap artist, to discuss the growing music scene and increasing the level of respect for hip-hop in Chattanooga. As part of Startup Week Chattanooga, we took the podcast on the road to the Tomorrow Building for our live panel with Tiffanie Robinson, Adam Kinsey, Jared Nixon, and Kerry Hayes. In this episode, you can hear more about the big changes we've made in the past couple of years and what you can expect for the Scenic City's future. Food, music and Made in Chattanooga? Sign us up! On this episode, we chat with our friends at Flying Squirrel, local neighborhood bar & restaurant, on how they've created your new 'third place'. Next, we catch up with local musician, Danimal, on how he's grown his music career in Chattanooga. In this episode, we're coming at you live from the first Rail & Hops Brewers Festival from the Choo Choo Gardens in Chattanooga. Henley and guest host Scott Bruce sit down with 3 local up-and-coming artists: Ashley and the X's, Okinawa, and Johnny Balik to talk about their music and the budding music scene in Chattanooga. Join Carlos as we talk to Stephanie Hays from Lamp Post Properties and manager of the Tomorrow Building to chat about Chattanooga Startup Week, an annual celebration of entrepreneurship and innovation. On this episode of the podcast, listen to Mickey's conversation with Clark Campbell, Co-Founder and CEO of Social Lion, as they discuss the Real Time Summit, a summit for social media leaders to share the power of real-time social media content. Then hear from Henley and Landon as they catch up with Ben Strawn, local singer/songwriter, to talk about the potential of the Chattanooga music scene. In this episode, we sit down with Seth Hill, founder and CEO of Swayy Hammocks, to learn about how their hammocks are changing the camping game. Next we hear from local R&B artist Phil McClain as he shares his journey with music and talks about some of his new projects. This week, we’re in the studio with Marco and Ramona Biscarini, owners of Vibrant Meals, a meal-prep delivery service in Chattanooga; and pop-folk singer Courtney Holder, whose band Hive Theory just headlined the Nightfall summer concert series and played at Riverbend Music Festival. In episode 11, Kate and Landon are joined by Shawanda and Jennifer, co-founders of The Chattery, a non-profit organization dedicated to making adult education fun and accessible; and Jack, Keith and Jeremy of the Native American ensemble Crazy Flute, aiming to share their heritage and culture with others through music. In this episode, we’re sitting down with Cameron Doody, president and co-founder of Bellhops Moving, to learn more about how they’re helping fix the moving industry. Next, listen to local jazz musician Tryezz talk about his new (vinyl!) record and how SoundCorps’ Sidewalk Stages program helped spark his career. Local politics and jazz-hip-hop music: two things you’ll get in episode 09! Listen to Mickey’s conversation with Chattanooga Mayor Andy Berke about how innovation has played a role in the city’s evolution. Then hear from Jesse and local musician Swayyvo about how his style and approach to music sets him apart. Join Maurice and Jess as they talk to Mary Stargel, director of Innovation District Programs, and local musician Eric Lisica, a.k.a., SoCro, about civic entrepreneurship, building collaboration and musical creativity in the Scenic City. On this episode of the podcast, sit down with account executive Maurice and copywriter Kate as they hear from Chris Cummings, founder and CEO of Pass It Down, and local bluegrass musician Lon Eldridge. Chris shares how this digital storytelling platform can help make sure no story goes untold; later, Lon shares his passion for early 20th century music and performance and even plays a tune for us. Join senior art director Jess and senior copywriter Brian as they chat with Chef Nathan Flynt of 2 Sons Kitchen and Market, and chess enthusiast Thomas Lane. Chef Nate regales us with his journey to Chattanooga and what he’s learned as a professional chef and restaurateur, and Thomas shares how chess can play a role in kids’ learning and development by fusing strategy, improvisation and fun. It’s a creative takeover for episode 5! Senior art director Jess and account executive Maurice chat with creative director Chris Logsdon and copywriter Desirae Smith about their creative side hustles and staying inspired. Chris tells the story of how The Godspeed Co. and The Shop Rag shirt came to be, and Desirae regales our audience about her Instagram stardom and advice about finding and owning your personal style. Copywriter Kate and account executive Maurice speak with Corinne Hill from the Chattanooga Public Library, and Sarah Obenauer from Make a Mark, a design and development marathon for nonprofits. Corinne talks about her background in libraries and how the Chattanooga Public Library is making a difference in the city and community. Sarah shares how Make a Mark started in Virginia, its mission to help local nonprofits and goals for the future. This is our third episode, so now you know it’s real (0:00 - 1:22)! Jesse and VaynerMedia creative director Chris Logsdon chat with Dakin Cranwell, owner/operator of American Draft, the country’s first pour-your-own-beer bar at the Chattanooga Choo Choo (1:23 - 22:12); and local community leader, festival creator and hip-hop artist Cameron Williams (23:58 - 38:20), a.k.a., C-Grimey (Music Performance 22:18 - 23:57 / 38:20 - 43:32). Jesse gives listeners an inside look at the Chattanooga music scene with Stratton Tingle, Executive Director of Chattanooga’s SoundCorps (i:16 - 25:55); and Chattanooga’s own podcast maven Heather Leigh Holt (25:56 - 51:11), better known by some as acoustic artist Heatherly (Music performance 51:12 - 57:40). Starting the podcast with a bang—Jesse and Mickey open the show (Intro 0:00 - 0:35) with Marcus Shaw, executive director of The Company Lab (0:36 - 21:32), and local music sensation Nick Lutsko (21:33 - 41:03), to discuss educating small startups, creating unique art in the Southeast, and Nick Lutsko’s band of puppets (Music Performance 41:04 - 45:26). Meet Made in Chattanooga: a podcast from VaynerMedia’s Chattanooga team, live from the Chattanooga Public Library. We cover business, innovation, creativity and entrepreneurship in the Scenic City. Let SVP Mickey Cloud and VP Jesse Hutchison tell you why Made in Chattanooga exists and what to expect!